Because a couch and high-speed internet can be a deadly combination, I have converted my table into a standing desk. 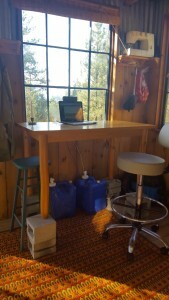 I bought 8- six inch blocks at the building supply store and ta-da, I have a standing desk. 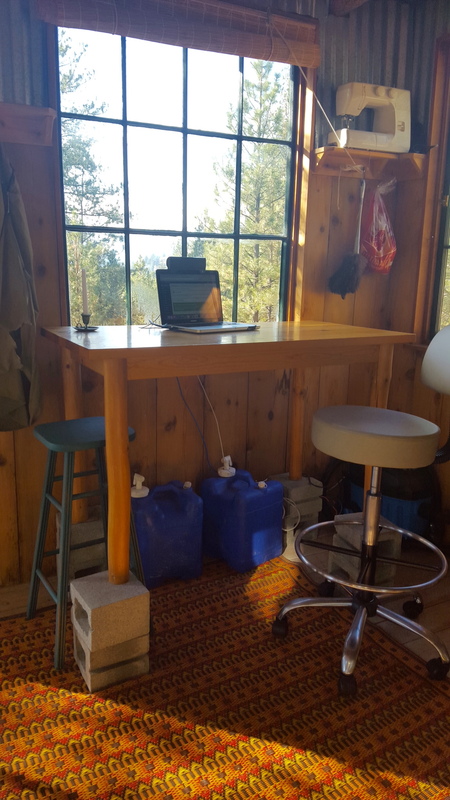 Probably 4- twelve inch blocks would have worked just as well, but first I was going for a counter height table and then changed my mind to a standing desk. I bought a drafting chair off amazon for when I would like to sit. I like the chair but the chrome was too shiny so I took some 120 grit sandpaper to it and now I’m much happier with it. I drilled a couple of holes in my floor and ran a 12 volt plug and an ethernet cable under my cabin and up to where they need to be hooked up, so I don’t have cables running all over my cabin. I wrapped weather stripping around the cables and stuffed it in the holes so it won’t let in cold air.